Obi-Wan Kenobi was born on this date in 1914. 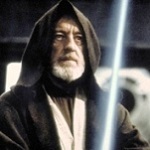 Sir Alec Guinness died miserable that he would be remembered for Star Wars instead of his many other roles. Writing prompt: Write a scene in which your protagonist does something entirely out of character for which s/he will be remembered more than anything else.